Do you still believe that goiters and nodules today are caused by iodine deficiency? If so, you’re in for a big surprise. Supplementing iodine can actually make your thyroid condition much, much worse. Today, goiters and nodules are most commonly caused by a much bigger and more complicated problem. It’s one of the most common causes of hypothyroidism today and a reason why so many thyroid sufferers are trapped in a perpetual state of hypothyroidism, with no end in sight. 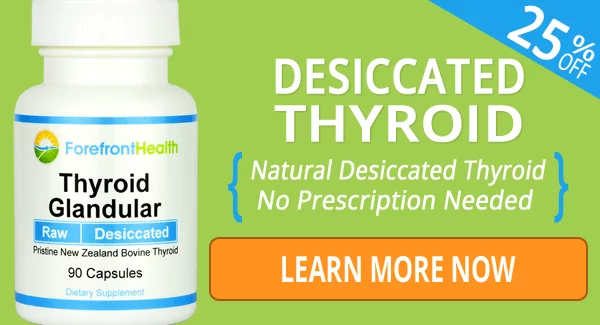 It’s something that we talk about a lot here at Forefront Health… and this is yet another way it can ruin your thyroid health. …yet to do so, you have to first understand how goiters and nodules develop. The most common cause of goiters and soft nodules today is the hormone estrogen. Estrogen is overproduced through aromatization of androgens into estrogen. Estrogen further builds up because it can’t be properly detoxified due to blocking of the glucuronidation detox pathway. Estrogen increases Thyroid Stimulating Hormone (TSH), which increases the amount of thyroid hormone the thyroid gland produces. Estrogen inhibits the proteolytic enzymes that allow the thyroid gland to release that thyroid hormone. Think of your thyroid gland like a balloon. The effects of estrogen are such that air (thyroid hormone) is being continuously added to the balloon (your thyroid), without any air (thyroid hormone) being allowed to escape. The balloon (your thyroid) will just continue to get bigger and bigger. The solution to the problem is to stop adding more air to the balloon while at the same time, letting air out, allowing the balloon (your thyroid) to shrink and normalize in size. We’ll cover this in more detail in just a second. Many people today still believe that goiters are caused by an iodine deficiency. Iodine deficiency does exist, and if one is severely deficient in iodine, they will develop an iodine deficiency goiter. Iodine deficiency must be confirmed through a 24 hour urine collection test. But, it’s much more rare than you realize. What’s more, supplementing iodine when you’re NOT deficient can make your thyroid condition much worse. If excess iodine itself can cause goiters and nodules, it doesn’t make sense to use iodine therapy if you’re not truly deficient. Iodine toxicity is a very real threat to your thyroid when using iodine supplements. So, iodine therapy should be avoided unless proper testing is done, or it can surely make your thyroid matters worse. Goiters and nodules can sometimes be a little tricky. As the thyroid gland becomes enlarged with too much thyroid hormone (colloid), you can run into issues where the thyroid gland unloads too much thyroid hormone at one time. This is called a thyroid storm. You see, this buildup of thyroid hormone in the gland can make you very hypothyroid because your gland isn’t releasing much thyroid hormone. Then, all of a sudden, your gland can unload thyroid hormone very quickly. This large amount of thyroid hormone being secreted very quickly can put you into what we call a transient or temporary hyperthyroid state. Often, thyroid storms occur in a cyclical pattern. It’s a cycle where you transition between symptoms of hypothyroidism and hyperthyroidism as your thyroid gland is blocked and enlarges (hypothyroidism), then unloads (hyperthyroidism) before becoming blocked again, starting the process all over. We have clients who have been misdiagnosed as hyperthyroid because they were seen by their doctor during an unloading phase, when hyperthyroid symptoms are often present. This can lead to unnecessary medical treatments such as thyroidectomy (surgical removal of thyroid gland tissue) or Radioactive Iodine (RAI) treatment, both of which cause permanent damage to the thyroid gland. Yet, the important thing to realize is that you are actually hypothyroid. In reality, this is just a “transient” or temporary hyperthyroid condition. The underlying issue is actually hypothyroidism due to estrogen suppressing your thyroid gland and driving this whole cycle. And unnecessary medical treatments that permanently damage your thyroid gland only make matters worse. Obviously, we don’t want to trigger the thyroid gland to unload too quickly and cause a thyroid storm. Instead, we want the thyroid gland to unload, or shrink, slowly and safely. This does take longer, but it’s a much more tolerable and comfortable experience. So, let’s break this down into a few simple to understand steps. TSH is a pituitary hormone that signals your thyroid gland to produce more thyroid hormone. 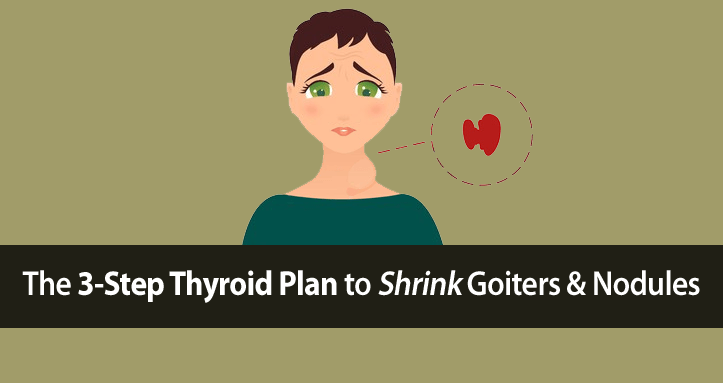 If you want your goiter or nodules to shrink, then we have to stop your thyroid from over-producing thyroid. Typically, we do this by supplementing enough thyroid hormone to suppress TSH to levels as close to zero as possible. Keeping your TSH suppressed is also very protective of your thyroid gland and helps prevent thyroid gland abnormalities. Once we stop the overproduction of thyroid hormone, we still have to work on shrinking the gland slowly. Shrinking the thyroid gland involves promoting the release of thyroid hormone from your thyroid gland slowly. The most effective way to shrink a goiter is through the use of progesterone. Just as estrogen blocks your thyroid gland from releasing thyroid hormone, progesterone does the opposite – it activates the proteolytic enzymes that release the thyroid hormone. Ordinarily, this is a very good thing, because we want to promote the thyroid gland to release thyroid hormone properly. Yet, we have to be careful when the thyroid gland is enlarged or there’s a goiter or soft nodules. This is because the progesterone can activate your thyroid gland to unload too much thyroid hormone at one time, which can give you hyperthyroid symptoms and make you feel very uncomfortable. That uncomfortable feeling is not something we want for our clients to experience. So, we often do a trial of progesterone while looking for signs of increased heart rate, heart palpitations, anxiety, etc. If these symptoms are experienced, then it’s best to focus on Vitamin E and metabolism first and re-introducing the progesterone later, because it still plays an essential part in fixing the underlying cause of the problem. Vitamin E is anti-estrogenic and can be used to reduce estrogen’s thyroid-blocking effects without unloading the thyroid gland too quickly. Then, we want to focus on diet to up-regulate (increase) healthy oxidative metabolism so that your body begins using more thyroid hormone and using it more efficiently. This will allow the gland to slowly secrete thyroid hormone, allowing goiters to shrink over time. After the thyroid gland has normalized, we can continue (or re-introduce) the progesterone and Vitamin E to help correct the underlying estrogen dominance. …You’re helping to protect your thyroid and prevent the future development of goiters and nodules too. And keep in mind that regulating estrogen also applies to the prevention of goiters and nodules too. You can never be too safe with your thyroid health. If you have a goiter or thyroid nodules, then you can use these same steps that we use to help our clients too. 1. “Goiter.” Mayo Clinic, Mayo Foundation for Medical Education and Research, 3 Mar. 2018, www.mayoclinic.org/diseases-conditions/goiter/diagnosis-treatment/drc-20351834. 2. Wentz, Izabella. “How to Shrink Thyroid Nodules – Dr. Izabella Wentz.” DR. IZABELLA WENTZ, PHARM D, 20 Jan. 2019, thyroidpharmacist.com/articles/hashimotos-and-thyroid-nodules/. 3. Shomon, Mary. “A Lump in Your Neck Could Indicate Thyroid Disease.” Verywell Health, 21 Jan. 2019, www.verywellhealth.com/goiters-overview-4013767. Tom, thank you for all you do! I have been on your program for almost one year. My last ultrasound a couple months ago showed that my nodules are shrinking! Please keep these wonderful articles coming! Hi Dawn, that’s great to hear! Many women who end up with goiters (myself included) noticed the enlargement following acute stress or stressful events. I know you mentioned estrogen dominance (which I can definitely see), but what are your thoughts about stress as a main influence or trigger on the development of thyroid disorders? my goiter and my nodules are growing, even though I regularly use bioidentical progesterone. I’m scared that one day I have to have my thyroid removed, it is growing inwards. it always seems to blow up like a ballon, when I get a sore throat, when I get stressed (which I often do but which has gotten much better with meditation, relaxation etc., but sometimes I have the feeling I’ll never make it and get more and more sick. I’ve noticed that I’m completely overwhemed with all the different and partly opposing advice out there on the internet andfor example eating has become a pure stress issue. I don’t enjoy food, I only analyze if it is going to do me good or bad (it can’t do me any good with this obsession. I guess, I have answered my question myself: as long as I can’t let go and relax I won’t get better. You have to also account for the degree of estrogen dominance or excess estrogen. Some forms of progesterone are not absorbed well, so the actual amount of progesterone you’re getting can be relatively low compared the amount you might need. i read your article above 3 steps to shrinking thyroid. does that mean stop taking my synthroid . i have been on 350 ml for 20 years . i only recently started investigating because i am one of those Canadians who believed doctors are gods. anyway i went and got all recommended vitamins except vitamin e and wellbutrin so i did not feel like taking myself out every day i have gained 40 pounds and i hardly eat as it is. i also demand the expensive free 3t 3 test and a nutrionist what should i do . i feel scared to trust anybody anymore. Hi Bonnie, I’m sorry to hear that. T4-only medications like synthroid don’t work for everyone. Nobody can recommend you stop taking it except your doctor. If it is lowering your TSH, then it is providing some protective effects. However, most respond better to the addition of T3. You can also talk to your doctor about trying natural desiccated thyroid, like ERFA. Can’t thank you enough Mr Brimeye! At a time when I’m about to give up you come jogging along. I truly believe Someone up there is watching, sent an angel to ease my so weary less functioning brain & body. You pinned it down when i couldn’t put it together. Keep up the wonderful work you do.May God bless you more & all of us here who are suffering. Hi Tom – I have sub-optimal hypothyroidism and am taking desiccated thyroid, however, my functional medicine doctor just prescribed vaginal estrogen cream to help with frequent urination. After reading your article, I’m concerned that I may be doing more harm than good by taking the estrogen. My TSH has increased to the level it was before starting desiccated thyroid 8 months ago – 2.25. I also have 2 small nodules on my thyroid. Your thoughts? Frequent urination can be caused by a few things. It can be a general response to an increase in inflammatory compounds that can irritate the bladder walls. This can come from within the bladder or even from the intestines. Another cause is interstitial cystitis has more to do with an abundance of mast cells in the bladder and an increased sensitivity to the mast cells. The general approach is to address the inflammation. Thyroid hormone is responsible for producing the natural anti-inflammatory compounds including the protective steroidal hormones such as pregnenolone, and progesterone. Collagen can also help due to its anti-inflammatory effects. It sounds like your functional medicine doctor believes that using estrogen will help improve bladder control by addressing vaginal atrophy. However, estrogen is largely involved in the histamine/inflammatory process as discussed here: http://www.forefronthealth.com/hypothyroidism-and-histamine-intolerance/ . Studies show that low dose DHEA used intravaginally can provide the same effect without the negative consequences of using estrogen. I have nodules and I am currently on Levothyroxine since one year. My next ultrasound is tomorrow and I am trying to convince my doctor to put me on Armour Thyroid.. Is it safe to take the Levo. and Armour together? It’s not the ideal ratio of T4/T3 but the addition of some T3 should likely be better than none. Thankyou Tom. Is there an alternative thyroid med that doesn’t cause the heart rate increase and general increase in anxiety? Hi Jan, the problem isn’t the thyroid medication. There are two primary causes of thyroid hormone sensitivity. In some cases, it’s due more to a nutritional deficiency. There are many that can cause this, but we find a magnesium deficiency to be most common. Many hypothyroidism sufferers also compensate by overproducing adrenaline and T3 makes us more sensitive to adrenaline, thus amplifying it’s effects/symptoms. When adrenaline is elevated, some people can’t tolerate much T3 (or thyroid medication containing T3) at all. Using too much for what your body can tolerate at one time can cause symptoms including elevated heart rate, heart palpitations, feelings of stress, anxiety, etc. This doesn’t mean that you don’t need the T3. It simply means that you can’t tolerate that large of an amount at one time. This is one reason why we always recommend starting with a small dosage and increasing it slowly. Multi-dosing can help as well as it spreads the T3 out over time as opposed to spiking T3 levels all at once. However, the real concern is often the adrenaline. Please comment on hyperthyroidism. My Tsh is borderline low but I have all the symptoms plus ave temp 98.1 and my heart rate 101 ave. insomnia anxiety either too cold or too warm restless legs constipation headaches light head. I had the f3 and f4 test and it was low side too. If you’re body temperature during the day remains below 98.6F and T3/T4 levels are on the low side, you’re not hyper-thyroid. A low TSH isn’t an indicator of hyperthyroidism either. It’s an indicator of how hard your thyroid gland is having to work. I have two large nodules, but my saliva hormone test showed very low estrogen and very high progesterone. What would you suggest in my case? I just got the results of my blood work today and my FT3 is 3.0 (6.1 in 5/17) FT4 is 1.4 (16.7 in 5/17) and TSH is at 1.07 (1.1 back in 5/17). I don’t really know what the numbers mean and is there an article where you discuss this? What is really concerning, but my doctor didn’t seem too worried about is my cholesterol…Total is 252, HDL is 43 and LDL is at 204! I hope my death won’t be painful. 🙁 I am trying to get hold of the dessicated thyroid but I live in Germany and I can’t just order it. German customs probably won’t allow it.